OSIRIS medium-resolution spectrum of J0815+4729 (black line) and the best fit obtained with FERRE (red line). Credit: Aguado et al., 2017. Spanish astronomers have identified a new carbon-rich ultra metal-poor unevolved star in the halo of the Milky Way galaxy. The newly found star, designated J0815+4729, could be the most iron-poor unevolved star known to date. The finding was detailed in a paper published December 18 on the arXiv pre-print repository. Chemically primitive metal-poor stars are important for studying the conditions in the early universe. Thus, astronomers are interested in identifying more stars of this type and deriving their chemical abundances. Large sample of such stars could be helpful in improving our knowledge about stellar formation and evolution. Recently, a team led by David S. Aguado of the University of La Laguna, Tenerife, Spain, has performed a comprehensive study of spectroscopic data provided by various instruments. They analyzed more than 2.5 million low-resolution spectra from the Sloan Extension for Galactic Understanding and Exploration (SEGUE), the Baryonic Oscillations Spectroscopic Survey (BOSS) and the large Sky Area Multi-Object Fiber Spectroscopic Telescope (LAMOST). They found about 100 metal-poor candidates and conducted follow-up spectroscopic observations of these targets. For the follow-up campaign, they employed the Intermediate dispersion Spectrograph and Imaging System (ISIS) mounted on the 4.2m William Herschel Telescope (WHT) at the Observatorio del Roque de los Muchachos (La Palma, Spain) and the Optical System for Imaging and low-intermediate-Resolution Integrated Spectroscopy (OSIRIS) instrument at the 10.4m Gran Telescopio Canarias (GTC) telescope, also at the Observatorio del Roque de los Muchachos. "We report the discovery of the carbon-rich ultra metal-poor unevolved star J0815+4729. This dwarf star was selected from SDSS/BOSS as a metal-poor candidate and follow-up spectroscopic observations at medium-resolution were obtained with ISIS at William Herschel Telescope and OSIRIS at Gran Telescopio de Canarias," the researchers wrote in the paper. According to the study, J0815+4729 is a main-sequence star located in Galactic Halo, some 7,500 light years from the center of the Milky Way and about 32,600 light years away from the Earth. Its effective temperature is approximately 6,215 K.
Aguado's team found that J0815+4729 has a metallicity [Fe/H] of at least –5.8 dex and a carbon abundance [C/Fe] of 5.0 dex. These values suggest that J0815+4729 could be the most iron-poor unevolved star so far detected. Moreover, it could also have one of the largest overabundances of carbon among the known unevolved stars. In concluding remarks, the astronomers emphasize the importance of further investigation of stars like J0815+4729. They highlight the need of high-resolution spectroscopic observation of unevolved stars that would derive other important element abundances of these objects. "Identifying and characterizing chemically these rare breed of stars will certainly shed light on the early chemical evolution of the Galaxy and the nature of the first stars," the authors concluded. We report the discovery of the carbon-rich ultra metal-poor unevolved star J0815+4729. This dwarf star was selected from SDSS/BOSS as a metal-poor candidate and follow-up spectroscopic observations at medium-resolution were obtained with ISIS at William Herschel Telescope and OSIRIS at Gran Telescopio de Canarias. We use the FERRE code to derive the main stellar parameters, Teff=6215+-82 K, and logg=4.7+-0.5, an upper limit to the metallicity of [Fe/H]<~-5.8, and a carbon abundance of [C/Fe]>~+5.0, while [alpha/Fe]=0.4 is assumed. 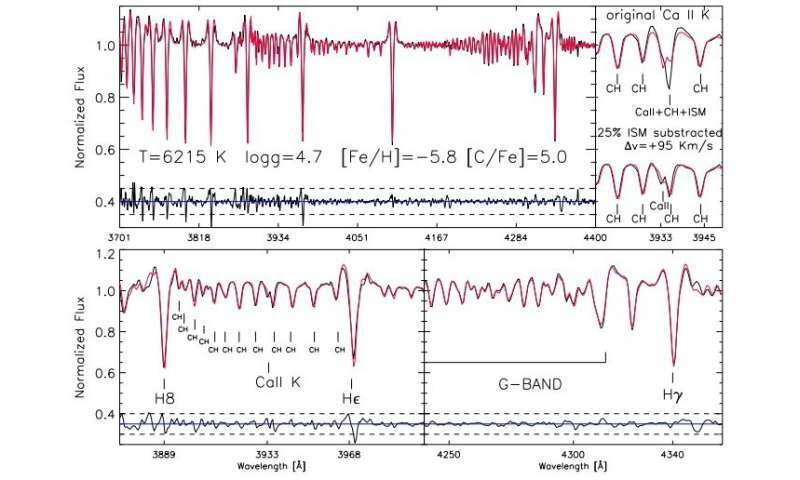 The metallicity upper limit is based on the Ca II K line, that at the resolving power of the OSIRIS spectrograph cannot be resolved from possible interstellar calcium. The star could be the most iron-poor unevolved star known, and is also amongst the ones with the largest overabundances of carbon. High-resolution spectroscopy of J0815+4729 will certainly help to derive other important element abundances, possibly providing new fundamental constraints on the early stages of the Universe, the formation of the first stars and the properties of the first supernovae. With an effective surface temperature of 6,215°K that would make it a Type F main sequence star, which should have a mass ranging between 1.04 and 1.4 solar masses. That also means that it cannot be older than approximately 10 billion years.